Lemon Solv | Pro Chem, Inc. 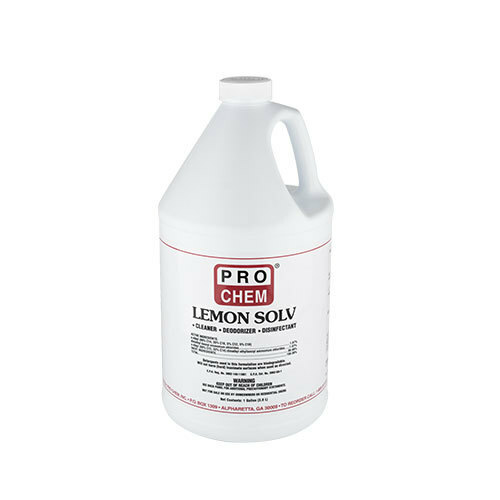 LEMON SOLV is a dual quaternary ammonium cleaner, deodorizer and disinfectant. 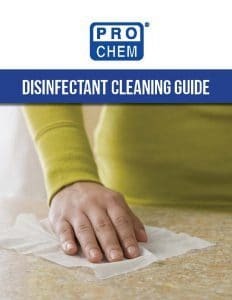 It offers a broad spectrum of germicidal activity to combat both gram-positive and gram-negative bacteria. A special detergent system provides excellent wetting and penetrating action against all types of dirt and grime. As a liquid deodorizer, this product’s effectiveness is unsurpassed. The lemon fragrance will tackle the most difficult deodorizing task from organic sources, such as body odor, rotten eggs, burnt meat, sewage renderings or decaying garbage. To disinfect hard surfaces such as walls, floors, and tabletops: Prepare a solution of 2½ ounces of concentrate per gallon of water. Can be applied with a mop, cloth, sponge or mechanical sprayer to wet all surfaces. Allow to remain wet for 10 minutes and then let air dry. For heavily soiled areas, a pre-cleaning step is recommended.